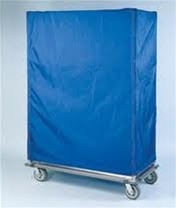 Nexel's Wire Shelving Cart Cover helps to keep the contents of your shelving units dust and dirt free. Made of water resistant, 400 denier nylon with reinforced corners and double stitching for maximum durability. 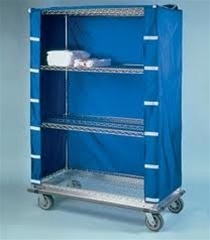 The Velcro front closure panel folds back for easy access to the shelving unit. Fits snugly onto our Wire Four Shelf Units. Available in Blue, Red and White. Don't see the color or size that you need? Contact us at 1.800.637.9508 to have your order made to your specifications. Please be aware that all orders are non-returnable. Please allow 14 business days for delivery.